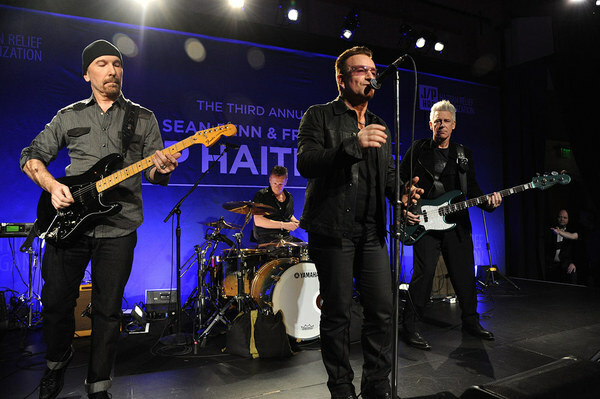 The band played a surprise short set to close Sean Penn's third annual benefit 'Help Haiti Home' at the weekend. Here's some clips. Performing I Will Follow, Desire and Vertigo to an audience of Hollywood stars, the night before The Golden Globes, it was a fine way to close an evening which raised $6 million for the J/P Haitian Relief Organization, working to support the people of Haiti make a sustainable recovery from the 2010 earthquake. An example of what humans could achieve if they only set their minds to that purpose. My musical Gods are more than amazing, I'm so happy when I see them together playing, wish there were longer videos of this. They're back. So great to see them play together after such a long time! Can never understand why these Clips are sooo short. But a great cause . A beautiful start to a beautiful cause!